P.A.O. B.C. reached the semifinals of the European Cup Winners' Cup and played against Dynamo Tyflida. 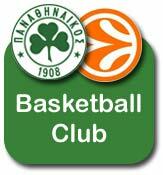 Panathinaikos reached the semifinals of the European Champions' Cup and played against Inis Vareze. Our team conquered the third position in the final four of the Euroleague, which took place in Tel Aviv. P.A.O - Barcelona 100-83. The same position was occupied by Panathinaikos, this time in Saragoza against Limoges 91-77. The first greatest moment in the history of Panathinaikos B.C. as the team become the King of Europe. Winner of the Intercontinental Cup. We played against Olympia de Benado Tueto (Argentina), 89-83. Panathinaikos reached the semifinals of the European Cup. The second greatest moment of Panathinaikos BC, became European Champion by beating Maccabi Tel Aviv BC, 73-67. Panathinaikos reached the final match in Suproleague, but was defeated by Maccabi Tel Aviv 67-81. PAO won their third European Champion's Cup by wining Kinder Bolgna BC in their home 89-83. Panathinaikos BC reached the third position in Europe by defeating the hosts of Final 4 PBC CSKA Moscow, 94-91. PAO BC wins the fourth top European title in their history, by defeating PBC CSKA Moscow, 93-91 in Athens Final 4. Panathinaikos wins the fifth Euroleague title in their history, by defeating (once again) PBC CSKA Moscow, 73-71 in Berlin's Final 4. Panathinaikos wins the sixth Euroleague title in their history, by defeating Maccabi Tel Aviv BC, 78-70 in Barcelone's Final 4.